Spin N Win Slots is a very advanced three reel slots machine. The designers really packed on the symbols into a little package. I thought that they did a really good job though because as most three reel machines are really simple, and in my opinion, boring this machine was actually very engaging and kept my interest for a pretty long while. The first thing I noticed about this machine was the fact that there were a lot of different symbols used on this machine. This was a good thing in that it prevented things from getting stale and repetitive too quickly but it was a bad thing in that it really drug down the winning percentages on a machine with so few reels. The betting range wasn’t great but it was more than serviceable for a three reel machine as the reels could be spun for as little as a penny or for as much as fifteen dollars. The sound effects were pretty generic on this machine and I really didn’t think they impacted the game in any significant manner. There were two different wild symbols offered on this machine that essentially did exactly the same thing. The first wild symbol was a picture of a multi color wheel and the second wild symbol was a picture of a five. These symbols appeared on every reel and could be used to substitute for any symbol in the game other than the each other and the bonus symbol. The coolest part about these symbols was that they were also prize multipliers. If one of the symbols was used as part of a winning combination the prize awarded as automatically multiplied by five and if two were used then the prize was automatically multiplied by 25. This would have been a really great feature had the wild symbols appeared on the screen a little more frequently. They very rarely appeared on the reels and more times then not, when they did, it didn’t lead to anything which was really frustrating. 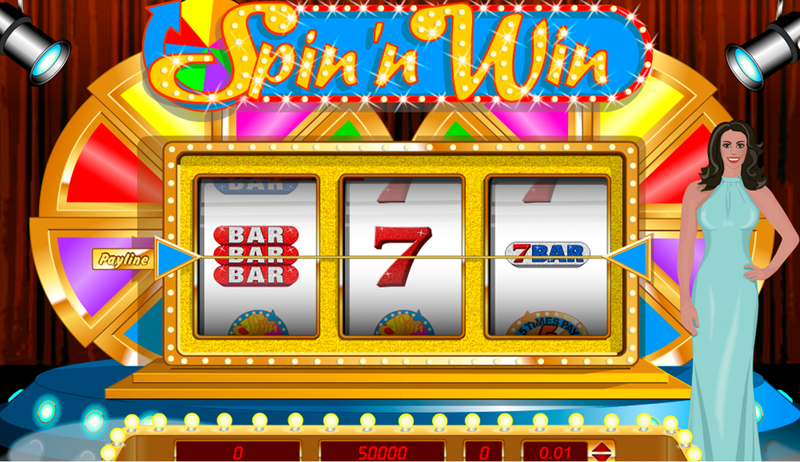 The bonus game offered on Spin N Win Slots was activated whenever a single bonus symbol appeared on the screen. The bonus symbol itself was a picture of an icon that simply said “spin”. It only appeared on reel three and it’s only purpose was to activate the bonus game. The bonus game itself was very simple as you simply had to click on the spin button to spin a giant prize reel. Where the wheel landed was the prize you were awarded. I liked the fact that this was a really short and sweet bonus game and that it was actually activated quite often which meant it had a big impact on the overall gaming experience. Overall, I thought this was a really cool three reel machine. Usually I get really bored quickly when playing three reel machines but that just didn’t happen on this machine. The designers added a lot of different features that kept entertained throughout my time playing and actually provided a lot of excitement. I would recommend this slots to anyone looking for a solid three reel slots machine.